It’s 4:30pm and I’m at a desk on the nearly windowless fourth floor. I sit surrounded on all sides by shelves I can’t see over and I’m willing myself, I’m determined, not to cry. When you catalog an archive, you might imagine that there’s a set of strict rules and guidelines that will make it clear how, precisely, to organize, separate, and label materials. You might imagine that there’s a rubric or handbook of some kind that you can wield against the utter chaos of thousands of sheets of paper arranged in no perceptible order. Stacks of paper barely contained by their binder clips and enormous red rubber bands, stacks of paper that weigh a ton, stacks of paper that all look the same. I am the cataloger of David Foster Wallace’s final work, The Pale King, and I’m here to tell you that in cases like these, the rules will only get you so far. It isn’t long before the careful methods of the archivist start to look feeble against the mass of information I’m trying to contain. The more likely truth is that you’ve never once imagined anything about the cataloger’s job. This job is an invisible one. An archive like the Harry Ransom Center is so viscerally structured that it seems governed by something inhuman. The impression of perfection you get from its rows of gray manuscript boxes filled with numbered manila folders and clean, soft, white sleeves seems impossible, mechanized, sterile. It’s like some kind of hospital, and the patients are sheets of paper in various states of health, but the bed linens are always the same blinding degree of white. There doesn’t, at first glance, appear to be any human involvement in the archiving process. My handwriting on each of the folders of The Pale King materials — small, slanty, usually a hair off center — is the only giveaway. I’m a graduate intern at the Ransom Center and I had the unexpected opportunity to dive headfirst into the most recent installment of David Foster Wallace’s papers. I also happen to be a reader and a scholar of his work, so this project intrigued me. That’s an understatement. I’ve worked extensively in the collection as a PhD student in the UT English department and I’ve presented papers on marginalia in his book collection. The chance to catalog the Pale King came up while I was writing a master’s thesis on Wallace’s Midwest, and I jumped at it. Everyone warned me that cataloging is an extremely dull, painstaking process, that the cataloger is required to operate as more machine than human. (I expected that it would be especially boring, considering I was cataloging a book about boredom.) And, I’ll be honest, much of it was slow and repetitive. But as I worked my way through the materials, something about this archive hit me right in my most human part. I found myself unable to operate as either cool cataloger or curious scholar. Without my realizing it, reading and sorting the collection took me way deeper into emotional territory than I tend to go. It’s hard for me even to explain. It seems like I might as well say, here at the outset, that mine is not the voice, the type of voice, most heard in the realm of written commentary on David Foster Wallace and his work. David Foster Wallace is a boys’ club. Ask anyone. Many others will have a lot of things to say about this set of papers. I expect to read comments from the members of the Wallace-l listserv, from certain reporters and bloggers, from the scholars I know, from the writers who always have something to say when it comes to Wallace. Most will be men and some will fit stereotypes that I don’t need to describe. Don’t be surprised if my take sounds a little different. This collection is more than a decade’s worth of amassed writings — on tablets, notebooks, reused stationary, on floppy discs I recognize from an era long past, on identical pages printed and reprinted — belonging to a writer whose method appears to be mindful anarchy. An elaborate spreadsheet accompanies the cartons when they arrive. It’s the one that Little, Brown editor Michael Pietsch used to compile the wreck of pages into the thing we know of as The Pale King. I study it diligently, but it doesn’t really help to find a way into the chaos. I’ve read the book three times by the time I begin to catalog it, so I feel like I should know my way around. Still, I follow the spreadsheet like a map and I hew to the physical order in which the sheets arrived. One of the itemized lists I read indicates that this is the order in which they were found. There are phrases like “From his desk”; “From his wire basket.” The visual landscape of a workspace emerges. I’m struck by the physicality and the ordinariness these phrases suggest. It doesn’t take long for me to feel strangely connected to the things I’m reading, to the drafts and the handwriting, the voices that emerge in the margins. I get emotionally invested very quickly. Even without a clear avenue through the papers, I’m pretty damn sure that you’re not supposed to get your own snot all over the materials. That’s definitely a rule. This is where the willpower comes in. Keep it together, I tell myself. You are a machine. You are processing information. Everything can be reduced to a discrete data point. Yes, I’m a reader and a scholar of this author’s work. But I’m nobody’s fan girl. I didn’t think this would be so hard, so fraught. Just as I’m about to get carried away by a wave of weird sentimentality, I see a familiar phrase from The Pale King smiling up at me as I fit the draft into its folder: “the human heart is a chump.” No kidding. I handle precious, singular objects everyday at my job, to the extent that it risks becoming rote. I don’t see why this should be any different. But it’s the closeness I have to the maelstrom of someone’s writing process, the closeness to the really difficult questions asked again and again, plus the responsibility I feel toward preserving every iota of it — it makes my task seem impossible. There’s too much life here to contain in boxes, folders, and telegraphic lines in a finding aid. Stephen Cooper, who cataloged the rest of the Wallace collection in 2010, advises me to take notes on what I find. I am supposed to write down pertinent details that need to be included in the finding aid and to flag pages that require repairs by our conservation team. What I do instead is I write down everything I observe about the stack of pages. I find myself writing sheets upon sheets of notes, all in pencil, about every item. I do this without really thinking about how it could be useful. I spend close to an hour on the first rubberbanded batch of materials. Stephen walks by and I hear something to the effect of, “Whoa. That’s a lot of notes.” I look down at what I’ve done and realize that none of it will go into the finding aid, that all this detail is what people come to the archive to find out for themselves. Each of my attempts to do this job flawlessly fails. I renew my efforts at detachment. Again and again I confront the fact that I am up against a mystery, a labyrinth of pages, and that it’s the puzzle itself we’re trying to preserve. Not solve. Just maintain. Let live on. My job is to organize it all just enough to preserve the wonder of its discovery. The most important thing is not to lose any information; no data can escape in the transaction. It’s the cataloger’s mantra. This is a tender operation. This is a conundrum wrapped in an enigma wrapped in a cocoon of my own sweltering nostalgia. Some things I find cut me. Some of the notes I read and I can feel my face aging. Do you know what that feels like? This archive is a chronicle of a final work. It is a chronicle of depression. It is the best thing I’ve ever read. These are not the normal cataloger’s problems. Throughout the margins of the collection there is a conversation between the writer and himself. There are notes that refer to the publication of Infinite Jest in 1996; some of the dates on the floppy discs precede it. There is the underlined word “panic.” And there are encouraging stickers that say, with a ridiculous face, “You did it!” “Good effort!” I make a mental note to acquire some stickers like these for myself. Some of the drafts are printed on Illinois State University letterhead with the convoluted motto “An equal opportunity/affirmative action university encouraging diversity” at the bottom of every page. I develop an intimate relationship with the angle of his staples, his evolving weights of paper, his process of starting over and over and over. The writer that comes through is nervous and uncertain, intimidated by his own harsh judgments. This feels familiar enough to me. This sounds like most writers. I’m not interested in some kind of David Foster Wallace myth-creation, some kind of canonization. We’ve arrived at that moment where now everyone has to weigh in and have their say over what type of person this writer was, how he treated others, what we can deduce about his psychology and how that can unlock his writing. Everyone’s running around with a new revealing fact. The way the cult of personality has taken over much of the discussion of Wallace’s work is something I find deeply aggravating. So if you’re waiting for me to construct a narrative for the ten years in which this archive was compiled or to explain something new about this person I never met based on the things he wrote down, well, I’m not going to. I don’t want to tell you any story about any person I never knew. I want to tell you the story of how I got to dive down deep into a mess of papers and how I came up laughing or crying or unable to speak. I want to tell you about connectivity. The secret, best, juiciest, and most exhilarating part of working in archives is the way they reach out and form webs; each thing points you to something else, gives you new things to read and avenues to explore. It’s constantly bewildering. 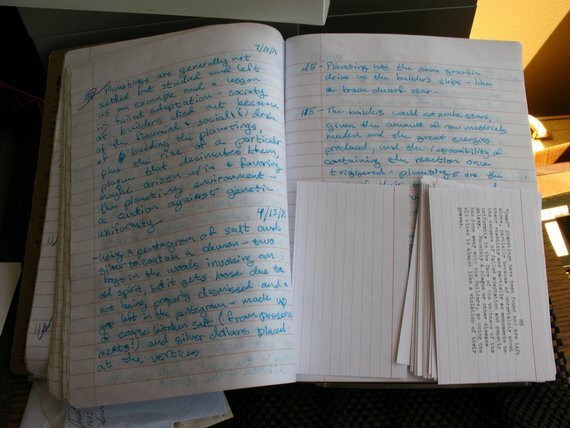 The network of connections that most captivates me in The Pale King archive is the one that appears in Wallace’s notebooks. Some of them resemble what you might call commonplace books, if we lived in the 1700s. They are archives of Wallace’s reading practices, quotes and clippings, words and their definitions jotted down. They are works of art, in and of themselves. The covers include: blue-eyed Cuddly Cuties kittens; characters from Rugrats; butterflies; and a waterlogged iteration of that omnipresent Klimt print. Many of the notes in these books describe people or places in the Midwest, Wallace’s home region that appears frequently in his writing. My own research is on place in contemporary literature, and I’m writing this thesis on the Midwest, so needless to say these capture my attention. The notebooks are filled with scraps of Midwestern dialogue that read like overheard bits of conversation, jokes, sayings. The voices that populate these notebooks sound very much like my parents, my grandparents; I’m from Illinois, too. I’m doing that thing here, committing that fallacy where I start to see my own experience, my own identity reflected back at me in someone else’s work. I’m in the middle of reading Nabokov’s Pale Fire right now and my role as cataloger, religiously removing rubberbands, sometimes reminds me of that book’s narrator. Not in a very good way, either. It’s a crazy thing to do, to start seeing your reflection in things that have nothing to do with you. But then, the untold truth about scholarly work, maybe about research of any kind, is that it’s always personal. It’s always about going after the unsolved mysteries of your own existence, your own heart. For as long as I’ve been able to figure, I’ve been trying to figure out what it means to grow up in a place that doesn’t seem to know it exists, and Wallace’s writing really helps with that. The Midwest he describes looks an awful lot like the one I know. Much real estate in the notebooks is devoted not to complex philosophical musings or elaborate plot design (though there’s plenty of both). Instead, I find brief, piercing comments on what it’s like to be alive everyday. There are a lot of notes on all the really basic parts of being a person — dealing with weather, enduring routine, running errands. There is a description of marriage that begins one notebook with the line, “It’s a lie that marriage means the end of romance.” It goes on to connect the theory of boredom that concerns much of Wallace’s later work with the reality of a long-term relationship. Descriptions like these, breakdowns of the most basic and impossible elements of quotidian life, are the things that speak to me. Every reader of his stuff seems to have her own version of what it’s about, and the version that compels me is this highly attuned reflection on the mundane, on lived experience. And then, in between the Midwesternisms and the reflections, there are references to books and articles, generative pieces of research or things come across by accident. This is where the archive really shines. There are quotes from books I’ve read and recognize, and quotes from things I’ve never heard of and write down on post-it notes and stuff in my pockets. I write down so many new words. Each day I get home and empty pockets full of notes. I find it almost impossible to finish cataloging. I spend days away from the fourth floor, ruminating over things I’ve read and unable to return to my place in the pages. I read things that really piss me off. I read things that frighten me. I read things that delight every bone in my body. When I’m working on it, I feel as though I’ve gone underwater. One day I forget to leave at five. The clock on the fourth floor has stopped at some point while I’ve been working. When I finally get up I find the elevator has been locked. When they call up the Pale King materials, many of these visitors will be looking for details to flesh out the persona they’ve been honing for this writer, to enhance the image they’ve been cultivating. And so I guess what I want to suggest is that maybe there’s room for other lines of inquiry here. Maybe, instead of formulating a theory that explains a person’s life or death, we could instead ask the questions that this archive asks of us as readers: what is a person for? How should a person be? What does life look like in all the parts of the world that don’t usually get described in detail? What should we pay attention to? How should we pay attention? How can fiction help us pay attention? Those are the questions that stick with me. I don’t know what people will find in these folders or how they’ll choose to interpret this new installment to the record of Wallace’s works. What I’m certain they will discover is that within the boxes, numbered 36-41, lies not a single unfinished work but an infinite web of possible works. The Pale King as we know it is, in the end, just one of these, one possible iteration. There are many years of life left in these pages. I hope other readers of the archive experience something like the joy and wonder and despair and unending strangeness I’ve felt, swimming around in another person’s thoughts for a few months. “Life is slow and dreadful.” That was wonderful, thanks! It’s amazing how many young people are taking part in NaNo this year! I’m taking part myself, though I’m old enough to the Adults Program though I’m only 14, and I was trying to organise some people from school into joining in … the majority of those that replied to my email/posters were Year 7s! (First years … not sure what that is in America). Very intriguing. Is it possible that they’re just more into writing, or is there something about young people that they believe things are possible which adults don’t …? What a great article! I’ve been doing Nano in the classroom since 2003, and with my current crop of students, since many of them were in kindergarten and first grade. It’s an amazing process and tons of fun, and I’ve seen endless benefits. I can only imagine what they will be able to write by the time they are in eighth grade! Amen! Between mobile phones and a million TV channels on demand, one would think a generation of zoned out Apple logo’d zombies putting pen to paper (er, mouse pointer to icon?) would be a drag, but I think there are still many who are unplugging and getting high on writing. Rather than see the technology boom as a huge sucker punch to imaginatives, technology can help us get away, and write anywhere we are. Oh wait, pencilpaper is portable too? Seriously? Wonderful! Its great to see them starting young in this age of social media saturation and e-devices. Beautifully written and inspiring piece, Laurel. A deep bow.